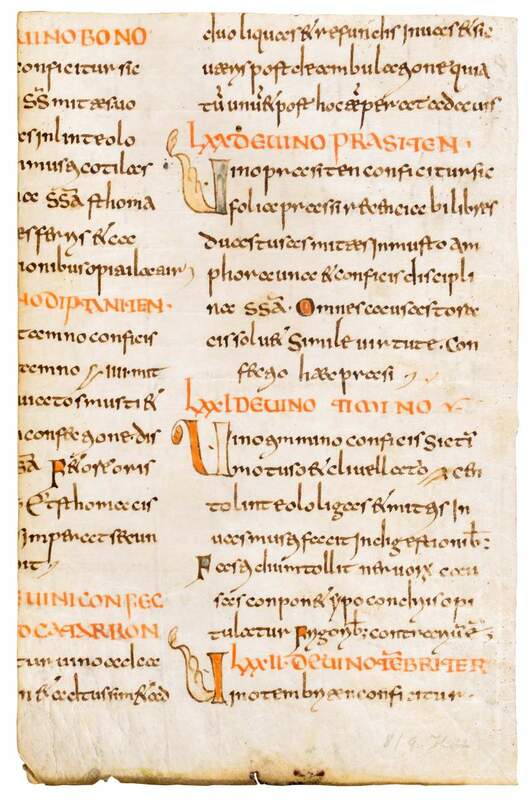 Large fragment of a leaf, including on recto and verso texts of chapters 63-72 from book V of Materia medica. The passage deals with wine made from various herbs. The continuous use of ‘hollow’ letters as initials filled out in colour, partly enriched with ornamental elements in the form of stylised acanthus leaves, has a particularly decorative effect. Dioscorides' De Materia Medica is the prime historical source of information about medicines and some 600 plants used in antiquity. This elegantly written leaf was made c. 750-800 and comprises a large part of a leaf from Book V: 63-72, which deals with wine made from various herbs. Translated from Greek into Latin sometime in the 6th century, the book continued to be of significant influence up to the Renaissance. Script and contents suggest that our leaf belonged to a manuscript that is considered the earliest known witness of this text version, originating in a scriptorium in the West Frankish region, perhaps around Fleury, Orléans, or Tours in the 8th century.